The all-new 5.0-liter dual-overhead camshaft (DOHC) V8 in the 2011 Mustang GT already is the most powerful naturally aspirated production V8 Ford has ever produced. To make it worthy of the Boss name, Ford engineers tweaked more than a few bits of the engine. 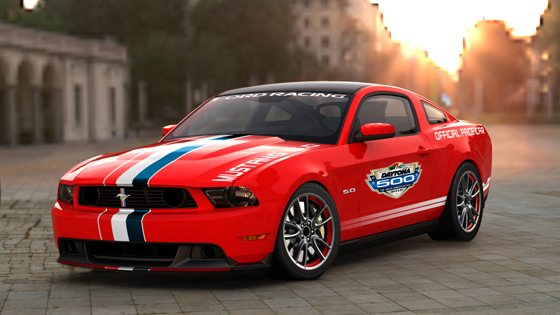 For 2012, Mustang Boss revives a legendary name known for uncompromising performance on the road and the track. Arriving in 1969, the first Mustang Boss was forged from a simple mandate by Ford management to the designers and engineers: Create a Mustang that would be unbeatable on SCCA race courses and local drag strips alike. Ford’s new 2011 Mustang GT will serve as the Official Pace Car at this year’s 52nd Daytona 500, the first time in 40 years a Ford vehicle has paced NASCAR’s biggest and most prestigious race. Under the hood of the Mustang GT Glass Roof Coupe will be Ford’s all-new 5.0-liter V-8, which will be available to customers in dealer showrooms this spring. The 2011 Mustang 5.0-liter V-8 is set to make its hip-hop debut alongside Grammy Award-winning artist Nelly as part of his upcoming album’s artwork. The album, set to launch this spring, will feature a tricked-out 2011 Mustang GT customized by DUB Magazine. 412 HP: The FORD MUSTANG 5.0 is back! The 2011 Ford Mustang GT arrives with an all-new advanced 5.0-liter V-8 engine, developed by a passionate cadre of enthusiastic engineers who rallied around the common goal of delivering more than 400 horsepower. Red is supposed to be the standard colour of warning. US car specialists GeigerCars.de from Munich have turned this established wisdom on its head, presenting their hottest shot with eye-catching bright green paintwork. The Ford GT “Geiger HP 790” is the third star after the Dodge Challenger SRT-8 (569 HP) and the Corvette Z06 Bi-Turbo (890 HP). Ford’s EcoBoost engine technology is driving younger, more affluent customers to Ford showrooms. And many of these buyers are hot to trade in their competitive-make vehicles to get their hands on one equipped with the fuel-efficient direct-injection turbocharged EcoBoost engine. Ford announced today it will produce an all-new purpose-built Police Interceptor specially designed and engineered to replace the Ford Crown Victoria law enforcement vehicle lineup in 2011. The new Ford Police Interceptor is being developed in conjunction with Ford’s Police Advisory Board, which provided input during the past 14 months on key vehicle attributes, such as safety, performance, durability, driver convenience and comfort. Soaring sales of the Ford Fusion have made 2009 already a record-breaking year for America’s most fuel-efficient midsize sedan. Sales for 2009 already have reached 151,137 units, eclipsing the previous Fusion full-year sales high of 149,552 in 2007.